I surprised quite a few followers on Instagram recently when I posted a picture of what my current stash looks like. After 20 years of quilting I’ve dejunked, destashed and cleaned out my space to the point that I finally realized that I am just not a fabric hoarder. Now to be fair, the bottom shelves (shown empty in the pic above) are filled with a few WIP’s, but not many – only enough that I can count on one hand, and mostly stuff that I can’t show in public yet. I’ve opined on my minimalist tendencies before and have to say this wasn’t an overnight process. And, I do have a small personal stash of precuts in another unit. But scraps? Overflowing bins? Not happening!! 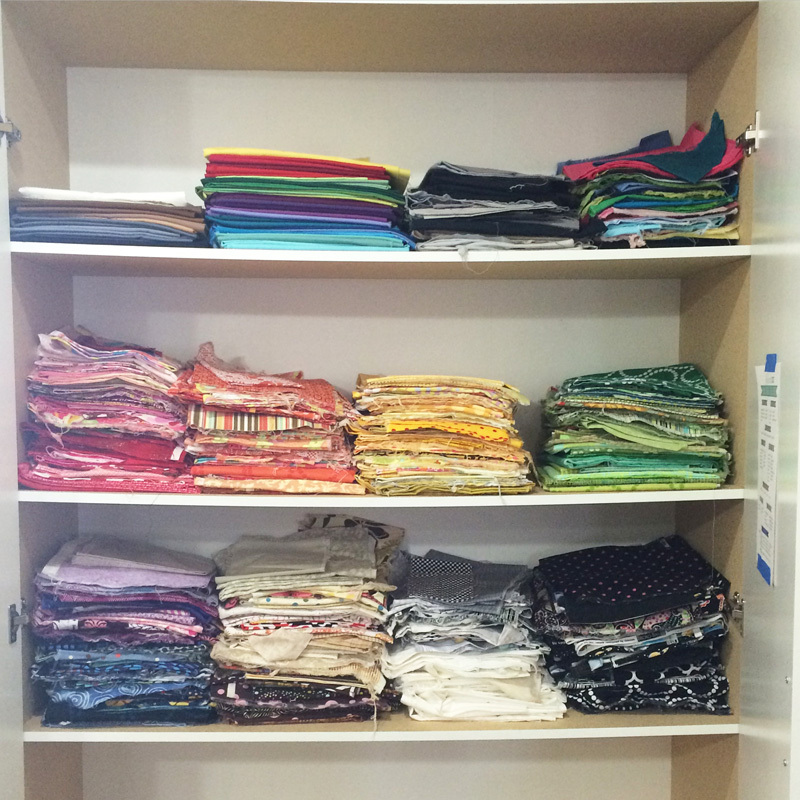 My precust stash – waiting to be made into quilts! I started with about 2 storage units worth of piles of fabric, which by some standards, still isn’t a ton. I pared that down to 1 storage unit about a year ago, and then recently whittled it down to about half of a cabinet for fabric, half for wip’s, and then the second cabinet for tools, supplies, thread, magazines, etc. And a whole empty shelf that makes me proud!! I need negative space in my storage, too, it seems! The reason I can live this way (nearly stash-less) is mainly because of the way I create. First, I design the projects I want to make in EQ. Then I import fabric swatches or colors I want to work with. Once I’m finished with my design, then I shop for fabric. I’ve tried it the other way around, trying to come up with a plan around a specific fabric and it just doesn’t work for me. I know this will invariably mean that by the time I’m ready to make a quilt, the fabric I want may not be available. But that’s okay, there’s always something else that will work, right? 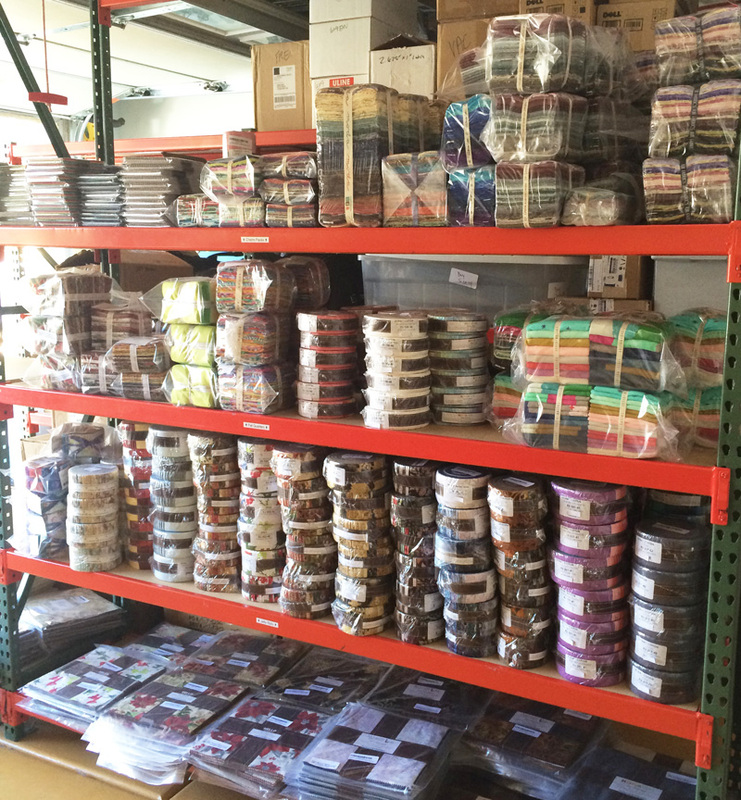 Precuts in my garage workspace – awaiting shipment to Amazon. Now I know some of you will say, “but that’s not fair – you have a whole store full of fabric!” Well, yes, that is true, but we don’t store it here. We process it when it comes in and then ship it off to the Amazon warehouses for storage. How do you like to store your stash? I’d love to see pics – please share them on my facebook group at Quilt With Christa! Don’t forget to sign up for Friendly Threads, my email newsletter. I have learned the hard way that a large stash really is not for me. Now I’m in the process of using what I like and getting rid of what I know I’ll never use. So what do you do with the off cuts and scraps? I’m living under the illusion that my fabric collection doesn’t count as stash because I rarely find what I need when I’m putting together a new project so have to go out and buy more! I too have realized I need to decrease my stash. I’m using it up making charity quilts and gifts. I have found my stash to be a burden now. So my goal is to make quilts using the stash. Charity quilts, gifts. what is designer or pattern name of that cute Andover dotted jelly roll? love your blogs! thx. I love working with scraps, so I keep them. My yardage is in control, although the fabric cupboard needs tidying. I start quilts from the opposite end — I let the fabric speak to me and then figure out a design. Tell me more about all those precuts in your garage. I have a fairly large stash. Right now I am thinking of ways to de stash too. I have fabrics I know I will never ever use and there they sit! I agree it’s far easier and better to have a pattern first and then buy the fabric than to try and find a pattern after you buy the fabric. Been there, done that. I have a fairly large stash, about a third of it inherited. I have a bedroom closet where it is stored.The shelves hold WIP or small bins of themed fabric, patterns, buttons, thread, etc. On the floor the bulk of my stash is in bins currently sorted by yardage. The closet also contains a bin with my embroidery floss and hoops, a bin for knitting supplies, a bin for finished crafts, a bin for other art supplies and misc. sewing stuff. I am in the process of resorting by color and getting rid of what I know I won’t use or don’t like anymore. What I don’t keep will go to charity quilters.My bins of batting (and mending) are stacked by the windows in my sewing room as a perch for my cat. I also just have a small stash and buy as I need for a project. Much easier to handle!